The seeds in the Men's Singles draw march on as a comedic lucky loser situation ensues. The opening Sunday of the Men's Singles draw contrasted the upset-filled day for women, where Johanna Konta, Venus Williams, and Jelena Ostapenko all perished from the draw. There were no major upsets for the men. No seeded players made their exit today in Paris, most of them getting through comfortably to the second round. Fourth seed Grigor Dimitrov was second on Court Philippe Chatrier against Mohamed Safwat of Egypt. Safwat entered the draw only an hour before the play started, as Viktor Troicki withdrew that morning. Dimitrov had a mostly straightforward match, though Safwat gave the Bulgarian a push in the final set 6-1 6-4 7-6(1). Following Dimitrov was the 15th seed and home crowd favorite Lucas Pouille and despite poor recent form, the Frenchman advanced 6-2 6-3 6-4 past Daniil Medvedev. Last on Court Suzanne Lenglen was second seed Alexander Zverev against Ricardas Berankis. The young German made good time on his express 6-1 6-1 6-2 win that lasted only an hour and 11 minutes. On the tougher side was the win of seed No. 32 Gael Monfils. The flashy showman faced his 19-year-old countryman Elliot Benchetrit. Monfils got off to a slow start and Benchetrit took full advantage of it, taking the first set 6-3. The 31-year-old turned on the engine and won the match 3-6 6-1 6-2 6-1. The player that looked most likely to be upset was definitely David Goffin. The Belgian struggled against the experienced Robin Haase and found himself two-sets-to-love down. The third set victory for Goffin was pivotal as Haase was unable to launch any sort of challenge in sets four and five. Goffin won the match 4-6 4-6 6-4 6-1 6-0. A shocking situation came up with the extraordinary number of withdrawals in the men's draw. Two more came this morning with Viktor Troicki and Nick Kyrgios choosing not to participate due to injury. Troicki's situation was sorted quickly as Mohamed Safwat is available and on-site. However, he was the last lucky loser left on site which created a precarious situation with replacing Kyrgios, who was scheduled to face Bernard Tomic on Monday at 11 am. The "next in line" was Prajnesh Gunneswaran, who got unlucky as he already entered the Vincenza Challenger and would have only been able to get the lucky loser spot with a special permission from the Vincenza tournament director. There haven't been any reports about Gunneswaran asking for one. 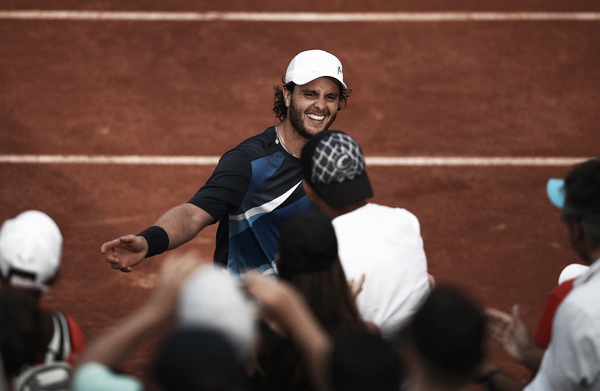 The Argentine Marco Trungelliti made a quick decision, grabbed his tennis bag, brother, mother, and grandmother to set out on an 11-hour car journey from Barcelona to Paris. Trungelliti arrived in Paris at around 11 pm, just 12 hours before his match against Tomic. If the Argentine would be able to pull off the upset, it would be one of the best tennis stories of the year.